Summary: Percutaneous sclerotherapy of orbital low-flow vascular malformations requires precise procedural guidance. For the treatment of a patient with an orbital venolymphatic malformation, we sought to optimize guidance by combining navigation assistance for needle placement with intralesional contrast medium injection for assessment of venous drainage. 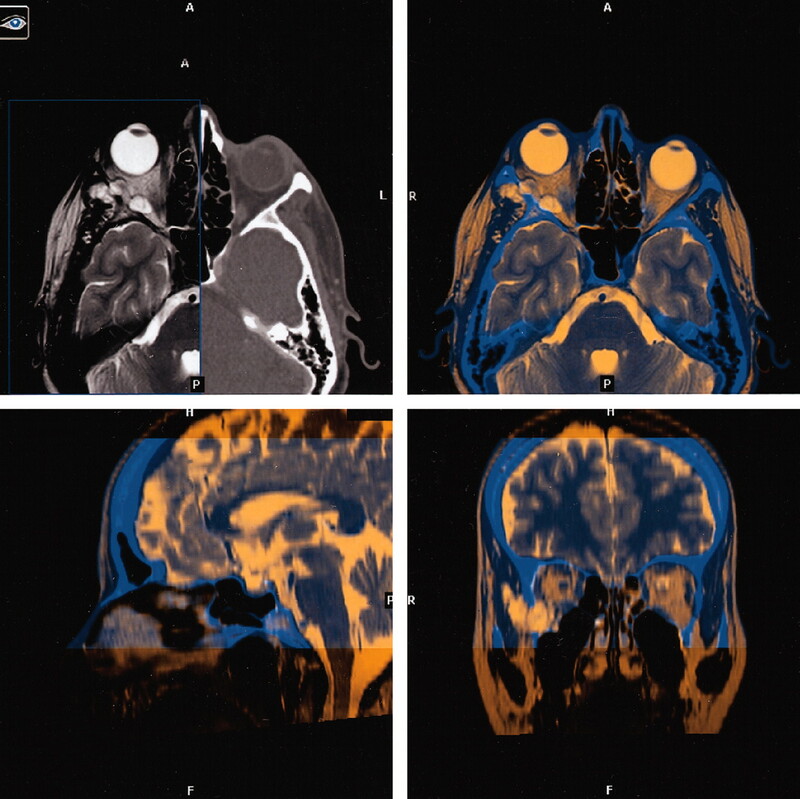 By using a surgical navigation system (Vector Vision, BrainLAB, Munich, Germany), multiplanar target lesion visualization was performed after fusion of CT and MR imaging data, which allowed precise puncture planning. Percutaneous sclerotherapy is currently the treatment of choice for low-flow vascular malformations (1–3). They may present as venous, lymphatic, or combined venolymphatic malformations occurring both in head and neck and in orbital locations (4). Traditional procedural guidance consists of contrast medium injection after direct puncture for assessment of lesional volume and venous drainage (1, 5). The treatment of periorbital malformations, however, is challenging, because of difficult access and possible compromise of ophthalmic veins, which may lead to orbital compartment syndrome and loss of vision (6). In the case of an orbital venolymphatic malformation, we sought to optimize guidance by combining navigation assistance for precise needle placement with an angiographic series after contrast medium injection for direct lesion visualization. This combined guidance appears valuable for percutaneous treatment of low-flow vascular malformations with difficult access and high risk due to possible compromise of draining veins. 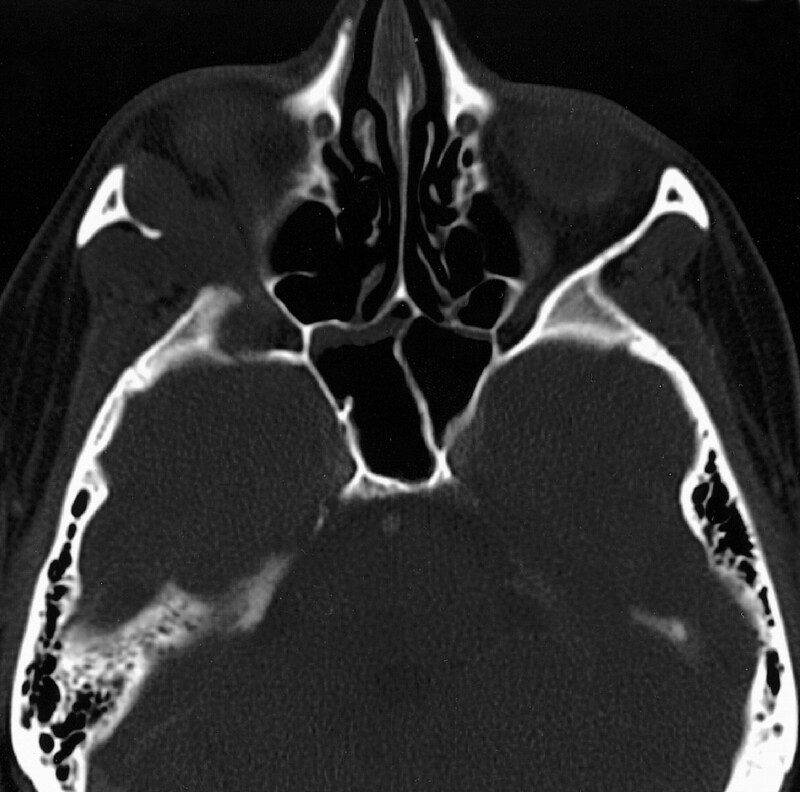 A 32-year-old female patient was referred to our hospital for diagnostic evaluation with a 9-year-history of slowly progressive proptosis, decreased visual acuity of the right eye, and severe pain on the right side of her face. The measurement of the sagittal globe position by the method of Hertel showed a significant exophthalmos on the affected side. Eye movement was not restricted bilaterally, and there were no signs of oculomotor palsy. The right temporal region presented with pain on palpation, and a right trigeminal hypoesthesia was noted. MR imaging revealed a sharply demarcated, T2-hyperintense, multicystic lesion both within and outside the orbit. The extraconal orbital part of the lesion caused deviation of the lateral and inferior rectus muscles and displacement of the globe in frontocranial direction (Fig 1). The inferior and superior orbital fissures were involved. 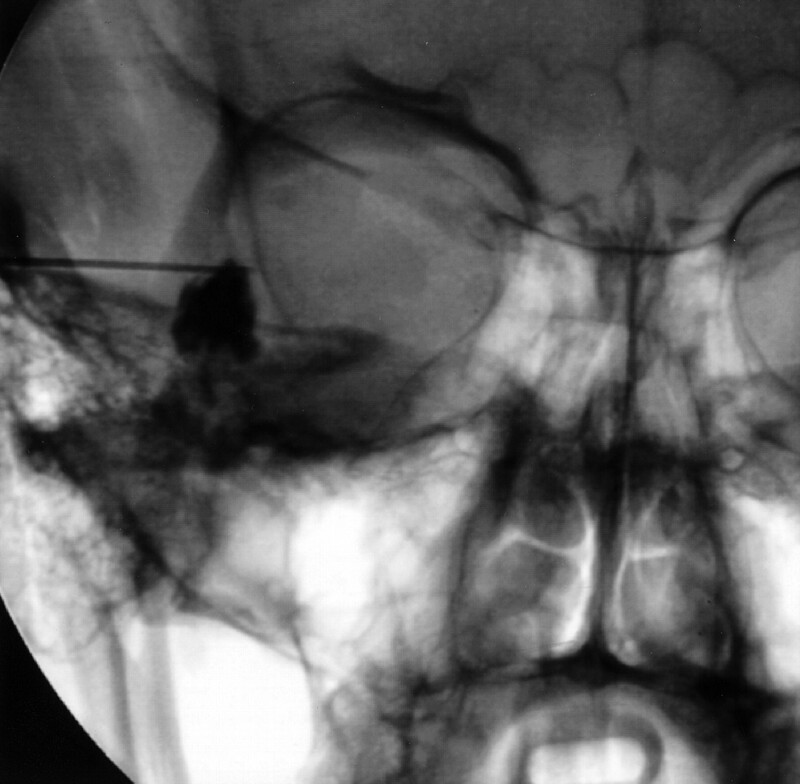 CT showed extension of the lesion into a gap in the bone structure of the lateral orbital wall (Fig 2). Imaging findings were considered compatible with a low-flow vascular malformation. A preinterventional subclassification of the vascular channels involved was not possible because of the lack of specific imaging characteristics. No associated vascular lesions were detected. T2-weighted coronal MR image shows a multicystic lesion both within and outside the orbit. The extraconal orbital part of the malformation causes deviation of the lateral and inferior rectus muscles. CT scan in bone window reveals a defect in the lateral wall of the right orbit. The dorsolateral part of the malformation extends into and through this gap. The risks of sclerotherapy of an orbital vascular malformation due to compromise of ophthalmic veins and postinterventional swelling, which may both lead to orbital compartment syndrome and loss of vision, were discussed with the patient. After informed consent was obtained, the patient was scheduled for navigation-assisted sclerotherapy under general anesthesia. The orbital part of the malformation was selected as the target for sclerotherapy because of its larger size and space-occupying effect. Navigation guidance was realized with a surgical navigation system (Vector Vision, Brain-LAB, Munich, Germany) equipped with a planning software platform (iPlan, Brain-LAB, Munich, Germany). CT was performed on a 16-section, spiral scanner (Somatom Sensation 16, Siemens, Forchheim, Germany) with a collimation of 0.75 mm, increment of 0.7, and pixel of 0.39 × 0.39 mm. MR imaging data were acquired as a T2-weighted, fast spin-echo, 2D data sets without a gap (TR, 5200 ms; TE, 94 ms; section thickness, 2 mm; field of view, 256 × 256; voxel, 1 × 1 × 2 mm; Magnetom Sonata, Siemens). Image data were transferred via the hospital network to the planning platform. 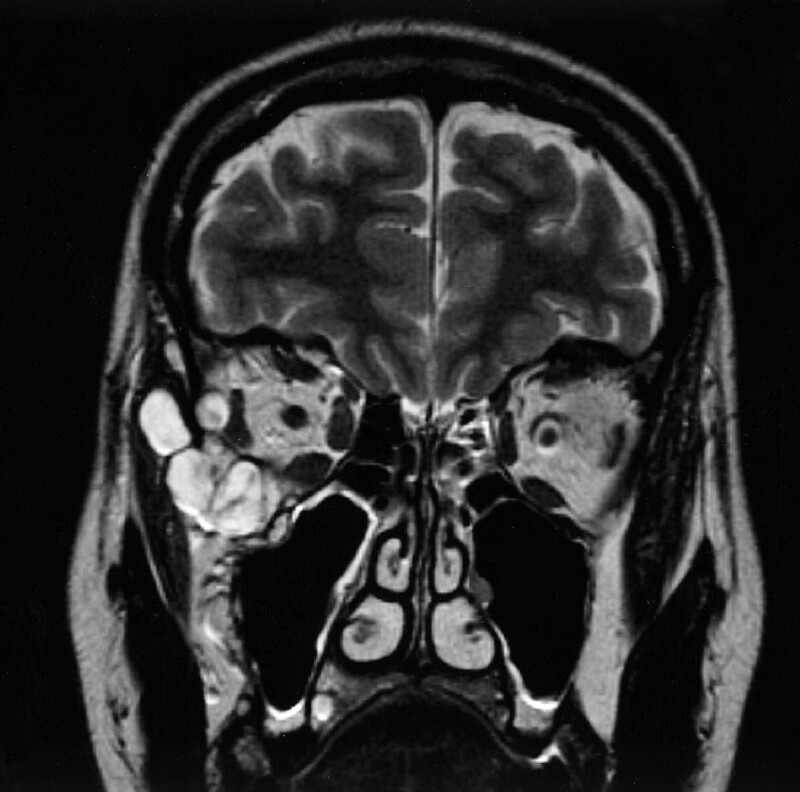 The venolymphatic cysts were segmented on the axial MR images. After fusion of the CT and MR imaging data, the target lesion was visualized in multiplanar image reformations (Fig 3). The puncture route was planned by trajectories from a temporal approach with access to the malformation through the defect in the lateral wall of the orbit. Processed data were then transferred to the navigation system. The interventional procedure was performed in the angiography suite of a biplane angiography unit (Neurostar T.O.P., Siemens). After CT and MR image fusion, the planning software platform visualizes the extension of the cystic malformation in relation to the gap in the orbital wall. After the patient was intubated, the skull reference array was attached to the patient’s head by using a flexible headband providing continually updated information about the relative 3D position. Patient-to-image registration was achieved by laser surface scanning. A 20-G cannula, placed on a needle holder and calibrated to the tool tip and the trajectory, respectively, was used for sclerotherapy. Following disinfection of the skin, the malformation was percutaneously punctured and navigationally guided according to the planned route. The tip of the cannula was precisely placed into the preinterventionally marked multicystic lesion (Fig 4), and mixed venous-lymphatic fluid was aspirated. After injection of contrast medium into the malformation, a biplane angiographic series was performed, which showed no relevant draining vein (Fig 5). The contrast agent was aspirated again, and 2 mL of ethanol 96% (Braun, Melsungen, Germany), mixed with contrast agent corresponding to 50% of the estimated lesional volume, was injected into the malformation. The cannula was removed after 10 minutes’ delay to allow for initial thrombosis of the cysts. During image-guided puncture, the navigation platform shows the percutaneous placement of the tip of the calibrated cannula into the malformation. The angiographic series after contrast injection into the malformation shows no intraorbital draining vein. Postinterventionally, a mild transient edema was seen. No complications such as nerve damage or visual deterioration occurred, and the patient was discharged on the third postinterventional day. 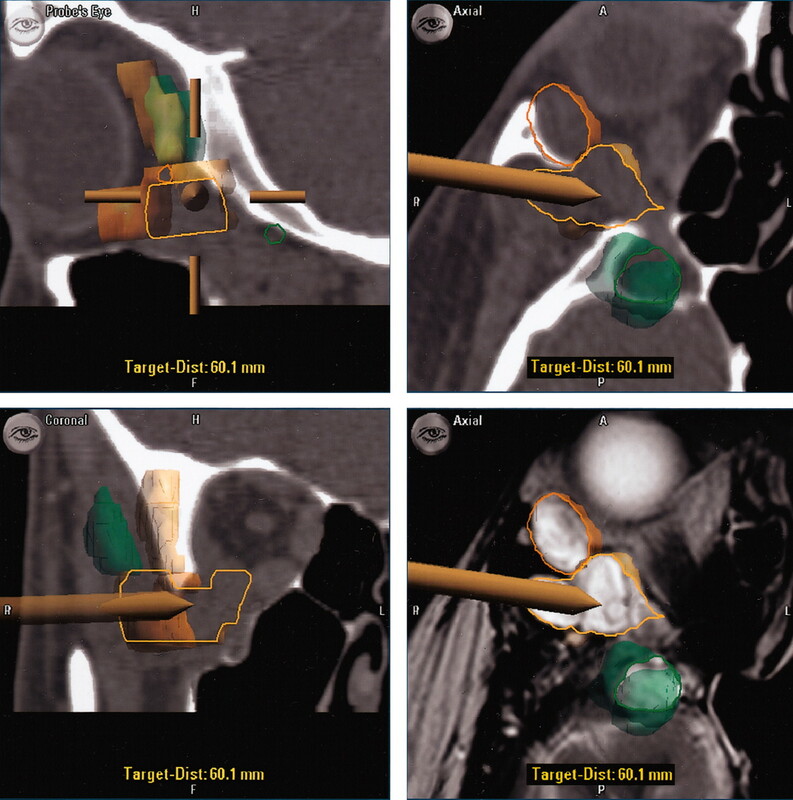 Follow-up evaluation revealed an acceptable reduction of the bulbar protrusion with clinical improvement because of partial shrinkage of the malformation. Low-flow vascular malformations are congenital anomalies that consist of thin-walled, vascular channels lined by quiescent endothelium (5). They present as venous, lymphatic, or combined venolymphatic malformations, which have a propensity for the orbit (6, 7). Symptoms depend on the predominant vascular channels with thrombosis and swelling in venous malformations (5) and intrinsic hemorrhage in lymphatic components (7). Direct intralesional injection of a sclerosant agent is established as treatment of choice for low-flow malformations (5, 6). The sclerosant agent causes a sludging of erythrocytes and a rapid subsequent thrombosis of the injected vessels followed by fibrosis within several weeks. There is also an initial perivascular inflammatory reaction (6). Several sclerosant agents are available. Sodium tetradecyl sulfate (Sotradecol 3%), a solution containing 2% alcohol, is a mild sclerosant agent that has been used for both head and neck and orbital malformations (6, 8). Ethibloc is a 60% alcoholic solution of a corn protein that precipitates on contact with blood and gives a viscous, embolic substance (9). It induces an inflammatory reaction leading to thrombosis and fibrosis. Ethanol is a very potent sclerosant agent that causes endothelial denudation, which leads to immediate thrombosis of the injected part of the malformation (2). A serious risk of ethanol sclerotherapy is migration of the sclerosant agent to draining veins causing thrombosis of functionally relevant veins. This risk has to be taken into particular consideration in the treatment of malformations in the orbit, where thrombosis of the ophthalmic veins may obstruct venous drainage to the cavernous sinus with the possible consequences of orbital compartment syndrome and loss of vision (6). Therefore, an angiographic series after contrast medium injection into the malformation for visualization of draining veins is mandatory. In our case, this series did not show any intraorbital draining veins. The interventionalist has to be aware that the sclerosant agent opens new passages as clotting occurs during the injection. To visualize the distribution of the sclerosant agent, it can be opacified with contrast agent. In ethanol sclerotherapy, intravenous corticosteroids are applied to reduce the degree of postinterventional swelling. Because severe swelling may cause orbital compartment syndrome, surgical standby should be provided for emergent orbital decompression. Another cause of complication is extralesional extravasation of alcohol with necrosis of adjacent tissue (1, 5). The risk is increased after repeated lesion perforation during needle positioning. Therefore, procedural guidance is required to ensure precise puncture. Color duplex sonography has been described as a real-time guidance technique providing visualization of the extent of the malformation and assessment of blood flow velocity (10, 11). The combination of sonographic and fluoroscopic guidance increases the safety of the procedure by direct imaging of venous drainage (1). CT guidance has been used for the puncture of deep, peripheral cisterns (12). Because of progress in fast imaging techniques, MR fluoroscopy allows direct visualization of needle placement and sclerosant agent distribution (13). The value of navigation guidance for percutaneous interventions at the orbit is based on the additional information derived from target lesion visualization after fusion of CT and MR imaging data (14, 15). Whereas MR imaging in T2-weighted sequences constitutes the technique of choice to delineate the extent of a low-flow vascular malformation (2), bony structures, and thus, the access for puncture are best visualized with CT.
With an intraprocedural application accuracy between 1 and 2 mm, depending on image data section thickness and the technique of patient-to-image registration, optical navigation provides a sufficient targeting precision (14, 15). The major limitation of the technique is the lack of information update on changes in anatomic topography in the course of an interventional procedure. During sclerotherapy, this limitation can be compensated by contrast medium injection for on-line lesion visualization. In such a combined approach, navigation guidance is a valuable adjunct to percutaneous treatment of deep-seated malformations or those with challenging access at the orbit or the skull base.